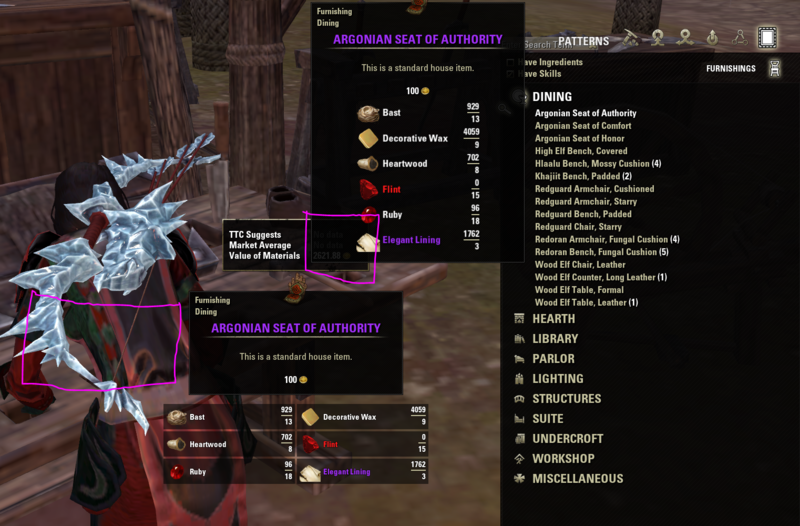 This addon adds a searchbox to Furniture and Provisioning recipe lists at crafting stations. A search is performed as you type into the box. As having a large list of known recipes can result in some lag, an adjustable delay has been built in to this search. This addon was created as a personal tool for my crafting and I hope to expand it with more housing, furnishing and crafting features I find useful. 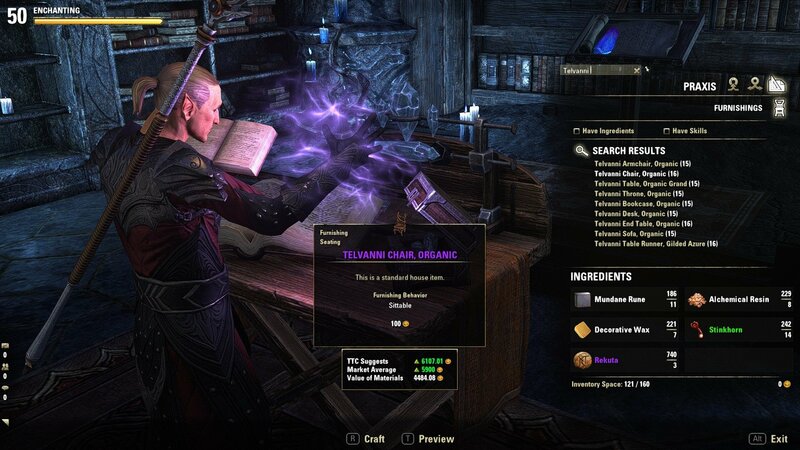 As such I've added craft-costs and profit indicators that take data from Arkadius Trade Tools, Master Merchant and Tamriel Trade Centre (if any of them are installed) and displays the information under the results tooltip at crafting stations. The market average and TTC suggested costs of furnishings are colored green if it would be profitable to sell at those prices, and red if their average is below the cost to craft them. Indicator arrows are also displayed and can be toggled on or off in the settings. This addon now also displays a button that fills in the Provisioner Daily Writ food and drink into the search box if you have the quest active. As a user of Favorite Furniture Crafter, I've implemented some compatibility with it (see Known Issues below, however). This addon also includes a doorbell (disabled by default) which announces guests coming and going from a player-house you are in, and also displays some basic information when you enter a house. /guests -- Displays a system message with some population information. While using this addon with Favorite Furniture Crafter you may notice some icon bugs appearing next to recipes. This only occurs when using the search filter while also filtering your favorites list. The searchbox and tooltip can now be dragged and repositioned. Position can be reset from options. Added a button that fills the search-text with the food or drink for Provisioner Daily Writ quests. Adjusted positioning of UI elements when loaded with PerfectPixel. Corrected an error that could occur when exiting the crafting station by opening one's inventory. Added price data information if MM, ATT, or TTC are installed, with profit indicators. Added option to clear or keep search-text after leaving a station. Added capacity information to doorbell feature. Minor tweaks and fixed messiness when using this addon with PerfectPixel. can you move panel to left side. Will do you one better, tossing up an update soon so you can drag the tooltip wherever you want. Last edited by Tanelornian : 03/26/19 at 06:42 PM.